Although New Albany owns all of the water mains within city limits, it contracts with the City of Columbus to provide water service and to maintain all public water mains. Service lines from the curb to the home are the maintenance responsibility of the homeowner. To report rusty water, please call the Columbus Division of Water at 614-645-7691. To report water breaks, please call Columbus Division of Water at 614-645-7788. For billing concerns, call Columbus Division of Water at 614-645-8276. The City of Columbus handles all water billing. For more information about the City of Columbus Division of Water visit Columbus Public Utilities. The New Albany Public Service Department maintains more than 60 miles of sewer lines that connect to 3,600 individual customers. These sewer lines are located mainly in the street right-of-way or public easements and are generally connected to sanitary fixtures inside properties, including toilets, sinks, bathtubs, showers, and washing machines. Nearly all interior plumbing inside a property (excepting the sump pump) is used to transport waste water from the property to city sanitary sewer pipes, and ultimately, to the City of Columbus to be treated at their wastewater treatment plant. 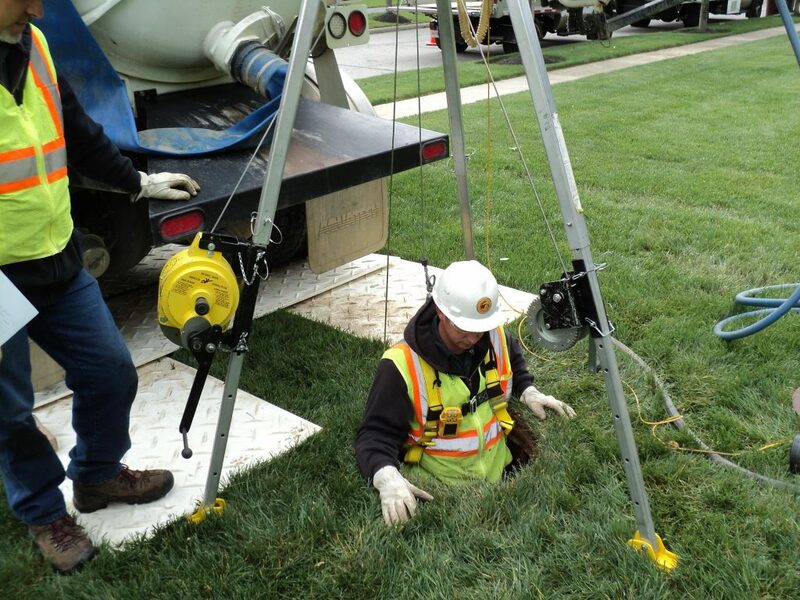 New Albany public service crews routinely inspect sewer lines by utilizing a remote “sewer cam” video camera and prioritize maintenance and replacement schedules based on years of collected data and analysis. As part of this maintenance, crews may conduct tests to identify cracks that can cause sewer leaks. Cleanings occur when grease, roots or other deposits cause clogs within sewer lines. Crews may also routinely power wash sewer main lines in known trouble areas even when there are no evident problems to clear pipes for proper flow and remove slight obstructions. 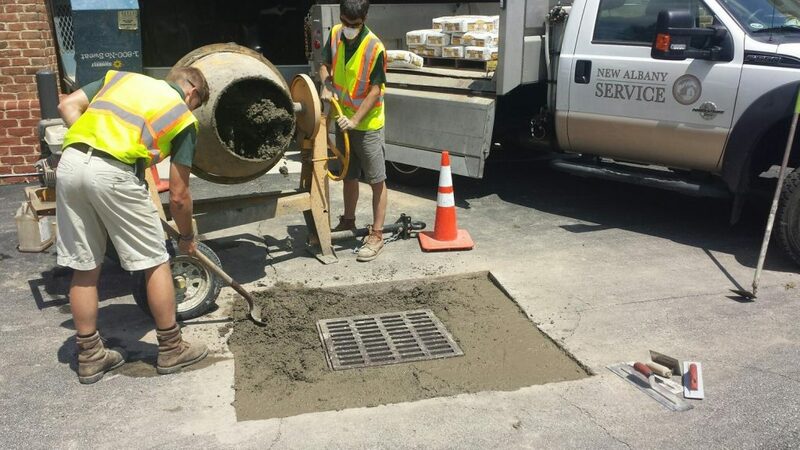 When sanitary sewer maintenance is necessary, New Albany public service crews will notify residents of the work to be done in their neighborhood. When possible, all cleaning will be conducted on public property, but workers may be required to access back yard or side yard easements as some manholes are located in these easements (for more information about manhole maintenance, please view the Sewer Manhole Maintenance section below i). Homeowners do not need to be home for crews to perform this work and crews will not need to enter homes. The New Albany Public Service Department is responsible for a 62 miles storm sewer system covering both residential and commercial developments. Storm water is conveyed through many different methods like curb drains, catch basins, structural pipes, culverts, ditches, swales, dry ponds and wet ponds. These systems are used to control storm water run-off during rain events by removing water quickly from surface areas, thus reducing flooding on roads and properties. Through annual maintenance and inspection of these systems, service crews preserve the integrity and operational effectiveness of the city’s storm water collection system. Put all toilet lids down and secure them with plastic wrapped around the bowl the day(s) of the schedule work. Plug all basement floor drains. This can be accomplished by purchasing an actual floor drain plug at a local hardware store or stuffing rags into the drain with a weighted down board to hold the rags in place. Remove the washing machine drain pipe from the stand pipe and cover the stand pipe with a plastic bag secured to the pipe. Pour water in all sinks and drains if any foul odors occur after the performed maintenance. All manholes must be accessible for routine inspections and maintenance. Those residents who want to hide a manhole on their property may place a lightweight planter or other easily moveable object on top of the manhole, but whatever object must be small enough that crews can easily move the object by hand with no special equipment. Manholes cannot be buried because they need to be easily accessible. Manholes may need to be raised to grade. If raising is necessary, digging will be required. After performing the necessary digging, crews will to the best of their ability return the property to basic original conditions by performing seeding or laying mulch as needed around the manhole. Crews may need to access these manholes on your private property. Typically, if your yard needs to be accessed, you will receive a letter or a door hanger will be placed at your residence if the maintenance is planned. Whether planned or an emergency, if crews plan to be at your residence for longer than one hour, we will attempt to make direct contact with someone at the residence to alert them to the necessary work. BE ON THE LOOKOUT! If you see an overflowing manhole, detect a sewer odor or observe evidence of sewer on the ground or in a stream, please report this by calling the Public Service Department at 614-855-0076 (or the New Albany Police Department at 614-855-1234 after 5 PM on weekdays or anytime during weekends). With your help, we can keep the lines flowing! NEVER pour grease down drains or into garbage disposals. The grease will turn into a hard solid that blocks lines and can result in a sewer back up. Let grease cool down and dispose of it in the trash. Putting food down a garbage disposal in your kitchen sink can be a convenient method of throwing away leftovers. However, many foods, such as certain vegetables and vegetable skins, have natural oils in them. These food particles can convert into grease in your pipes and sewer service line. Frequent use of a garbage disposal can contribute to blockages in service and main lines. Roots from trees can grow into sewer line joints and obstruct flow. Currently, city crews do not inspect private sewer laterals; such laterals are the responsibility of the homeowner. If the city ultimately determines that a customer’s service line is blocked by root growth, the resident must contact a licensed plumber to have the line cleaned from the house to the sewer drain. If there are several mature trees in your yard located near or around where your service line runs, you may want to periodically have the sanitary sewer service line checked and/or cleaned out by a plumber, especially if your toilets, sinks, etc. are experiencing frequent blockages or backups. Stop running water, flushing toilets and taking showers in the home. If possible, turning off the water in the home is advised. Immediately call the New Albany Public Service Department at 614-855-0076 (or the New Albany Police Department at 614-855-1234 after 5 PM on weekdays or anytime during weekends). Even if you suspect the problem may be on your private property service line, it is best to call the city first before you call a plumber. Crews will check main lines to identify and correct the problem or determine whether the homeowner needs to call a plumber.) This step could save you an unnecessary plumber’s bill!